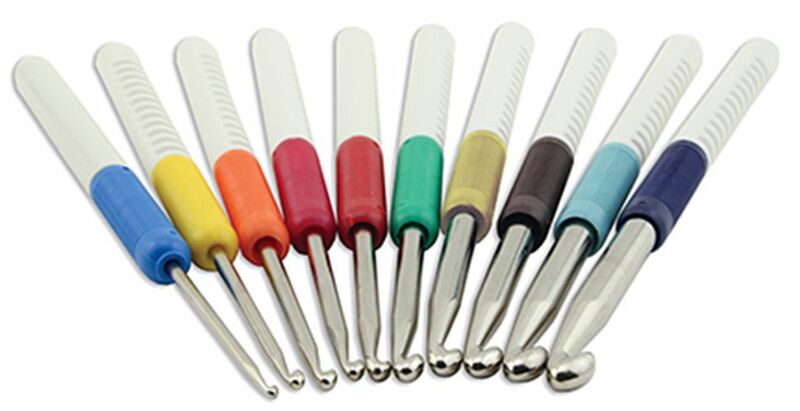 Our most popular set of crochet hooks! With sizes A - J you&apos;ll never again be missing the size you need as you crochet away a Sunday afternoon. You can’t miss with the sturdy and attractive design of Skacel’s Addi crochet hooks. Cheerful colors make each size easy to identify. The comfortable molded handles are easy to grip and slightly flexible, just enough to help with hand fatigue and make your projects a breeze. The durable steel hooks and high impact plastic handles won&apos;t crack or break. As Skacel says "excellence is in the details" and their carefully crafted products truly do excel. Made in Germany and backed by a lifetime guarantee. Skacel&apos;s crochet hooks are a great value and this set makes a perfect gift for your favorite crocheter or for yourself. If you love the quality of Skacel tools then save time and money and get the ten hook set, available only from Halcyon Yarn! Gift Certificates and indispensable tools - now it's your turn!